Usually, I combine poultry and green chiles, but the tomatoes and black beans nicely complemented the dark-meat turkey and chicken. Best part of all? A freezer full of leftover chili for the next cold spell. That looks great! Black beans are so good and good for you! 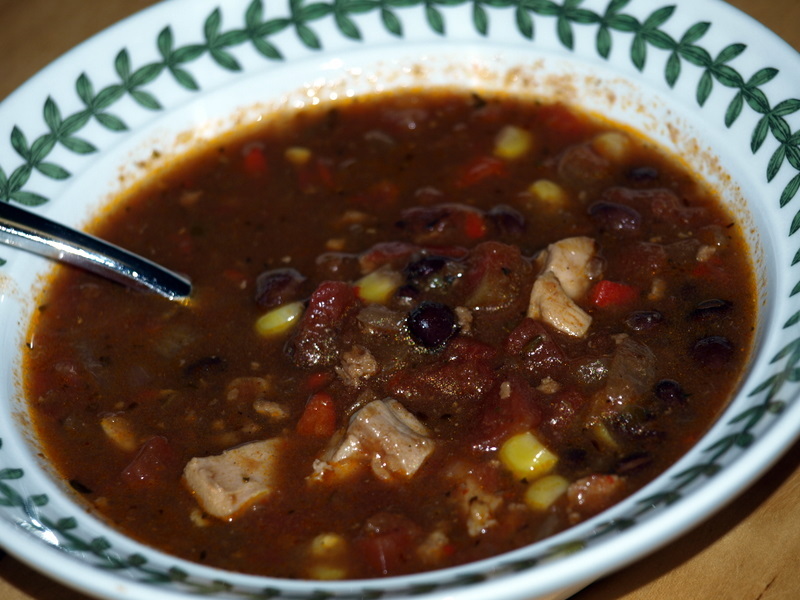 There is usually Black bean or White bean chili in my freezer! My feet are FREEZING! I made a big pot of pozole for the same reason. Next will be chili. Can’t beat a spicy bowl of goodness for warding off the chill. It’s definitely socks-inside weather. I swear, one day I’m gonna live in a house with warm floors. Last week I made chili con carne and something really seamed off. I added a touch of salt here, some chipotle there. I forgot to add my ground pasilla and aji peppers! I just went downstairs it it is still sitting in my spice grinder. Head slap. Well your chili looks great, Celeste! Even if it did make me feel stupid, ha ha. No need to feel stupid….just make another pot with the chiles and put the two batches together. Voila, the chili is fixed right up.